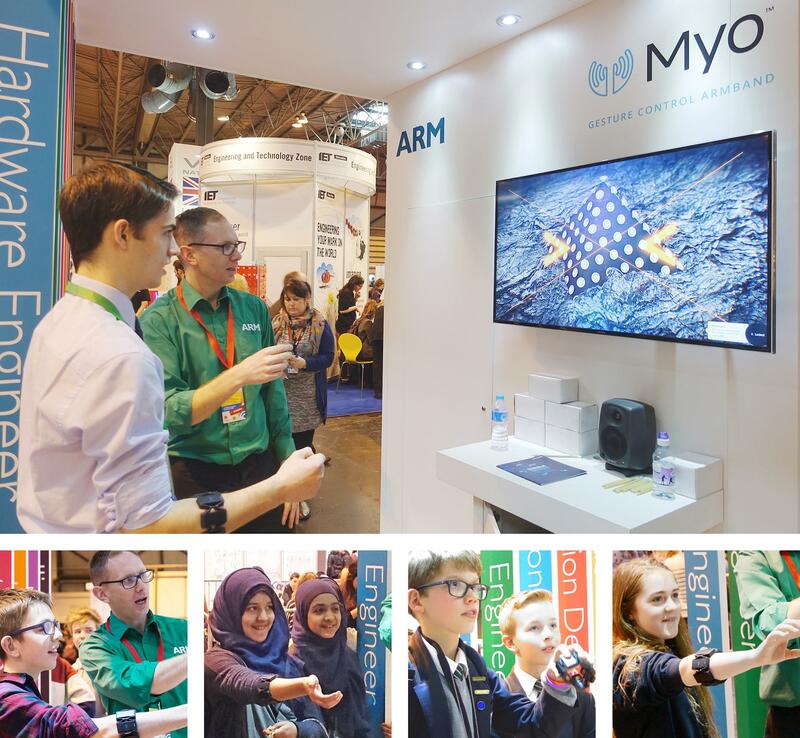 To further ARM’s work in encouraging students to study and pursue science, technology, engineering and mathematics (STEM) subjects, I developed a demo for ARM’s outreach at events such as the 2016 Big Bang Fair. The demo is based around a Myo armband, which detects hand gestures through muscle tension in the arm (a method known as electroMyography). By performing hand gestures, a user controls a musical sound track and associated visuals displayed on a monitor. As well as showcasing how new technologies can be used for creative applications, the demo also highlights how alternative control interfaces can be useful for people with limited motor functions. Inside the Myo is a Kinetis K20 MCU from NXP, which includes an ARM Cortex-M4 processor. Using the Myo API, which provides both raw sensor data from the armband and control data from detecting hand gestures, control signals are mapped to audio and visuals by transforming data from Myo using the Open Sound Control (OSC) protocol. The system has two modes, one for younger children (approximately below 10) and a second for older users. The modes use different methods of interaction and have different levels of complexity, to reflect the age ranges and the difference in their size and muscle development. The mode for younger children only uses the Myo’s gyroscope and accelerometer and maps movement to strumming chords of a virtual harp. Here, they can emulate playing a harp by holding the Myo in their hand or wearing it on their arm. The speed of movement and the tilt angle control the way in which the virtual harp is played. They can strum slowly or fast, change chords and watch the notes appear as patterns on-screen. The mode for older children with larger arms, allows for mixing together different instruments (drums, bass, and synth) by performing five specific hand gestures. The mode also applies effects including distortion, filtering, and modulation by using data mapped from the Myo’s accelerometer and gyroscope. Hand gestures control instruments and arm movements control the intensity of the various effects.